paper askew studio: Check This Out! More new toys to play with! The "Check This Out" arrow and the sentiment "Awesome" are from "Little Yellow Bicycle" and were part of my Gallery Idol prize. I believe I received the whole "Zach's Life", the stamps, chipboard, pattern papers, album...the list goes on! I was so totally spoiled....tee hee!! A great line of products if you have boys, I have three (including my DH of course). 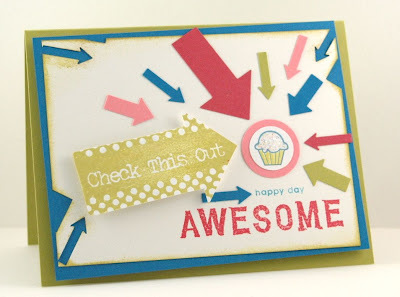 The cute little cupcake and the sentiment "happy day" are from Stampin' UP as well as the punched out arrows and paper. I made this card for Kristina's color challenge, gotta love her challenges! SO, this is what I came up with... I wonder if I could get away with giving it to a boy?? Maybe too much pink in there heh? Anyway, thanks Kristina for another fun color challenge!! 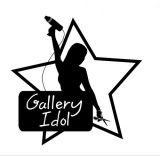 Speaking of Gallery Idol, I have decided to Chair the "Reflections" program at school. After going through the whole Gallery Idol contest I felt that Chairing Reflections and bringing it to our school would be a way of giving back to my community. I would love to give kids the opportunity to feel special about their artistic abilities and support their creativity. I am so lucky to have three other volunteers to help me with it. Have any of you done this program here in the US? It is basically a science fair type of situation only for the Arts. There are categories and a whole judging process, ribbons a ceremony and all. I am really hoping I can get as many kids interested as possible and to make each and everyone of them feel special about what they create. See ya tomorrow for my Friday Card Flick!! very cool...sure to catch Kristina's eye! Oh gorgeous card! I love that all of the arrows are going towards something so yummy! I love how you used the colors from the challenge too! Ah, what can I say but....AWESOME!!!! I absolutely LOVE it! This is too cute! Love the arrows!! Awesome, love it! It is so fun! We do Reflections in our school district, and it is a wonderful opportunity for everyone to be recognized, beyond the usual academic achievers. Good for you! SUPER cute card, love the little cupcake!! Great card and not too much pink to give to a boy! Glad to hear that you are doing the reflections, since you are involved it will grow!!! I love all the arrows!! I've been wanting the arrow punch from SU for awhile. might have to get it now!!! I love the card Pam. If you are worried about the pink, just change the circle behind the cupcake to a different color. But I think it is fine, the way it is. Terrific job! So clever, I just love it! Love the card!! All the arrows are awesome!! Oh, this is AWESOME :) I love the arrows and the little cupcake is just adorable! Great Card! I love the sentiment and how you used all the arrows! Very Cool!! you can't miss this one! LOL! very cute! !